5000 square feet. Free wifi lounge. Coffee bar (Coffee Box). Art gallery. 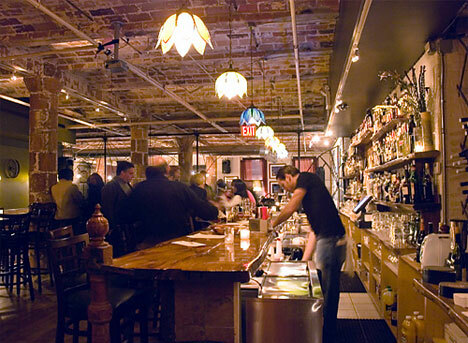 Restaurant and Bar (reBar). Community tasting market (mid ’07). Those are distinct places with their own unique names, not one venue calling itself an art gallery coffehouse restaurant because it serves coffee and has art on the walls. Not only that, reBar just won Timeout New York’s “Best New Bar of the Year.” Of course, there’s live music, an organic menu selection, and it’s open until 2 am on weekdays, 4 am on weekends. Thanks to Maxeme at Chicamala Productions for the reference – shouldn’t be a surprise that they do MTV promo shoots. Have you dreamt of enjoying two of your favorites together.The restaurant created by Mr. Jason has a unique feature in that way, the walls have adorned with wonderful painting.Party lovers can surprise their guests by selecting this place and cater the food for soul and stomach.